Model 1430 Stereotaxic Instrument is a general purpose, heavy-duty research instrument. Its superior rigidity, large frame bars and precision bearing surfaces assure absolute alignment of laboratory animals for indefinite periods of time. Model 1430 Frame Assembly includes one set of ear bar locators, Model 1210 Table Mount Base Plate (4¾” x 3¾”) and Model 1225 Universal Swivel Stand which allows dual plane rotation. Model 1245 Cat / Monkey Adaptor locates the animal firmly and accurately by means of tapered ear bars which fit into the external auditory meatus. Adjustable infra-orbital clamps and a vertically adjustable palate bar prevent rotation of the skull. (6.3 mm square with 50 mm calibration). The majority of Kopf animal adaptors can be used with this stereotaxic frame. Model 1430 Stereotaxic Frame modified with Model 1725 Universal Clamp and Stand Post mounted to Model 1711 Intracellular Base Plate or with Model 925-A-B Universal Clamp and Post mounted to 1211 Base Plate. 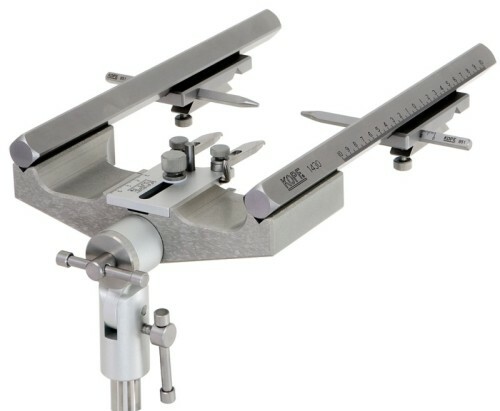 These versatile options enable the frame height to be easily adjusted up or down, as well as moving the entire stereotaxic instrument to a new location. Stereotaxic “U” Frame with one set of ear bar locators. Model 1210 Table Mount Base Plate 4¾” x 3¾”. Model 1225 Universal Swivel Stand. including one set of Model 851 Standard Solid Ear Bars. Unique manipulator positioning allows four electrodes to be placed within a 2 mm diameter circle. Electrode manipulators can be mounted from either end of the A/P bar. Vernier scales on manipulators assure unmatched accuracy and repeatability. Ideal when there is a critical need for rigidity. Able to add accessories to meet future needs. Frame variations for special applications available on request.